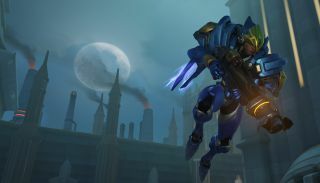 Pharah's other abilities include a knockback wrist rocket, and an ultimate that takes the form of a salvo of mini-rockets. Mostly, though, this character's all about the primary attack. You'll be able to try it all later in the year, when Overwatch hits beta.